Your rear brake pads don't contribute as much stopping power as your fronts, but you shouldn't ignore them. Luckily, changing your rear pads is a relatively painless process that requires a minimal amount of tools. 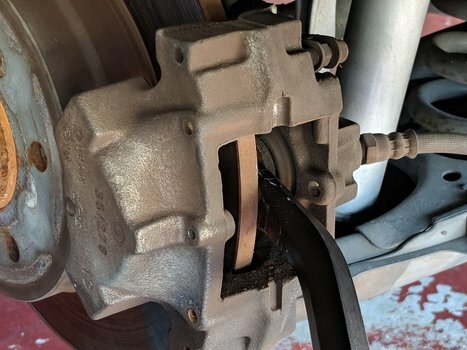 You don't even have to remove the caliper! Note that the photos taken for this guide are specific to the NA Crossfire. 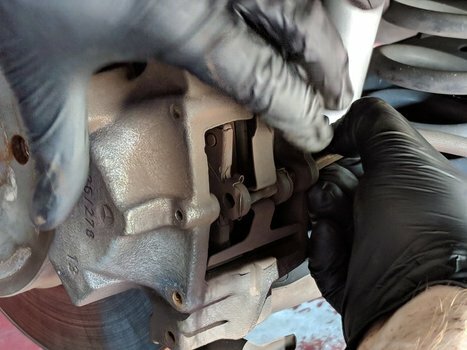 The SRT6 calipers are larger, with two pins instead of one, but the process is otherwise the same. 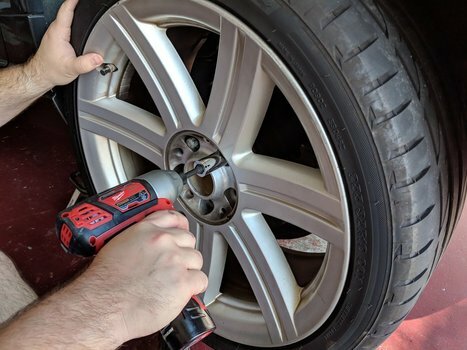 While the car is still on the ground, remove both hub caps with a small flathead screwdriver or plastic trim remover and loosen the lug bolts on the rear wheels. Decide how you're going to lift the car. We've found it simplest to lift the car by the front jack points (just behind the front wheel wells), sliding the jack stand under the rear jack point once sufficient ground clearance is available. Never, ever remove the wheels or work on the car unless it's supported on a jack stand. Relying on the jack to keep your car elevated could result in severe damage to you or the vehicle. 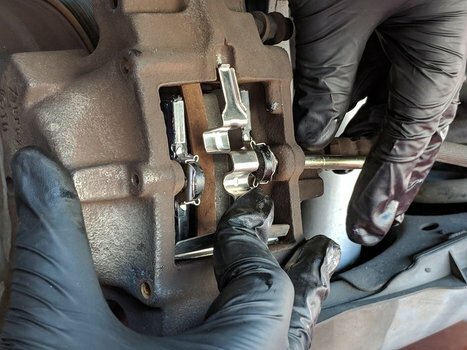 Once supported on jack stands, remove each wheel by loosening the lug bolts and removing them with a breaker bar or wrench. Pull the wheels off and set them aside. Luckily, changing the rear brake pads is a piece of cake - you don't even have to remove the caliper. Locate the brake pads on the outboard face of the caliper. They are held in place by a pin and retaining clip. Using the mallet, begin to remove the pin by hammering the small end of it poking out from the front face of the caliper. You'll need to push the pin towards the inboard side of the caliper, in the direction of the body of the car. Once you begin to loosen the slide pin, you'll need to use a punch to push it all the way out of the caliper (if you don't have a punch set handy, a set of Allen keys will work just as well.) Tension is kept on the pin with the retaining clip, so applying pressure on the clip can make removing the pin significantly easier. Once the pin is clear of the clip and both brake pads, just pull it out. Take care that the pin doesn't damage the brake line on the inboard side of the caliper! Once the slide pin is removed, set it aside and remove the retaining clip. Both brake pads can now be pulled out. In my case they slid out fairly easily, but if they give you trouble you can use pliers or a grip to remove them. Once freed from the caliper, set them aside. Before installing the new brake pads, it's a good idea to pop the cap off the brake fluid reservoir in the engine bay. The reservoir is located on the driver side of the engine bay towards the back. 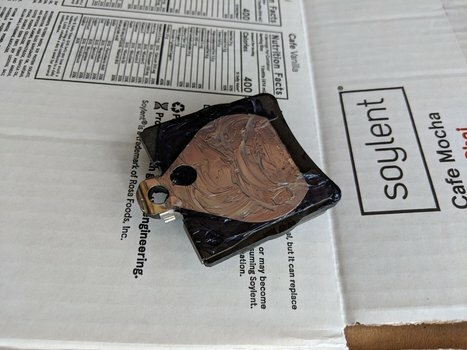 When you compress the pistons in the caliper to install the new pads, the fluid level will rise in the reservoir, and may cause it to overflow beyond the maximum level. To prevent this, have a spotter watch the reservoir during the following steps, or preemptively drain a small amount of brake fluid using a clean turkey baster or fluid pump. To prep the pads for installation, it's best to apply some brake lubricant to the back of each. Make sure you're wearing a clean pair of gloves for this! 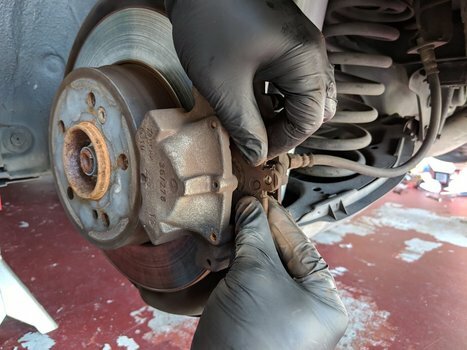 Spread the lubricant evenly over the backside of each brake pad, taking extra care that you don't get any lubricant on the actual ablative surface of the pad. Once both pads are lubricated, set them down on a clean surface. 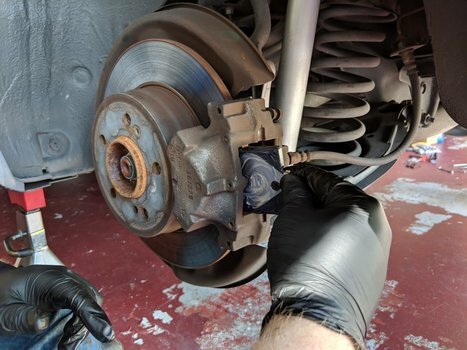 Remember to make sure the ablative surface of the brake pad doesn't in contact with anything dirty if you can help it. Contaminants on the pad can negatively affect stopping performance or damage your rotors! 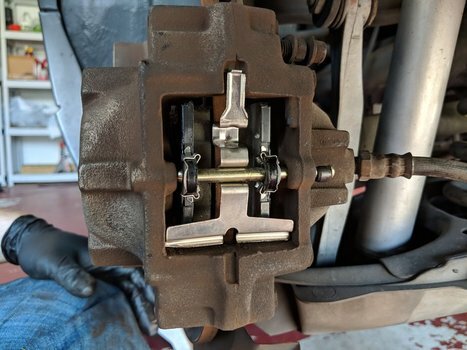 Because the new brake pads will likely be much thicker than the old pads, you'll have to compress the inboard and outboard pistons in the caliper to make room. Use a pry bar to slowly compress both the inboard and outboard pistons on the caliper until they're flush with the surface. If you have a spotter available, now is a good time for them to watch the brake fluid reservoir to ensure it doesn't overflow. Once both pistons are compressed, carefully insert each brake pad into the caliper. 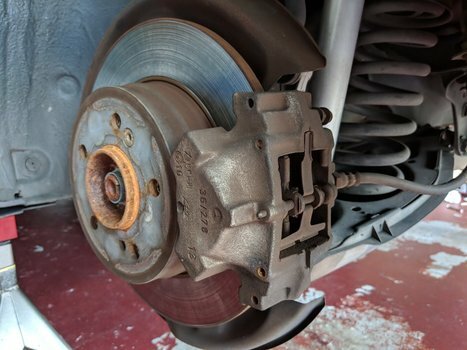 It goes without saying, but make sure the ablative surface of the brake pad is facing the rotor. Right on! Now it's time to reinstall the clip and slide pin to hold your new brake pads in place. Position the clip so the wide end of "T" shape is on the bottom, with the narrow end slotted within the narrow groove on the caliper. Begin threading the slide pin from the inboard side of the caliper, through the first brake pad. You'll have to compress the clip to get the slide pin across it; apply pressure with your thumb as you push the pin across. Ensure the pin sits on top of the retaining clip, holding it into place. 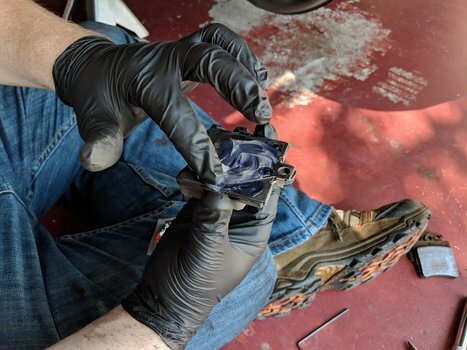 Continuing to apply pressure on the clip, push the pin as far as you can, through the second brake pad and into the hole on the outboard side of the caliper. When you've pushed the pin as far as you can, it should look something like this. Now the fun part. 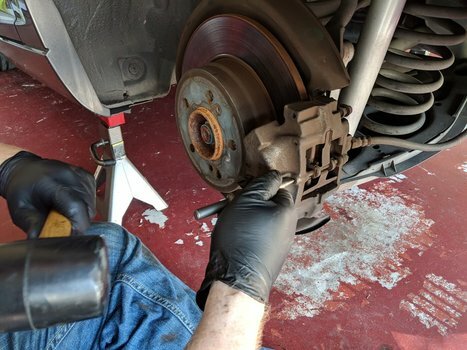 You'll need to use the mallet to push the pin the rest of the way, ensuring the flat end of it is flush against the inboard side of the caliper. This is complicated by the fact that the brake hose is in the way and doesn't give you much room to tap the pin with enough force. 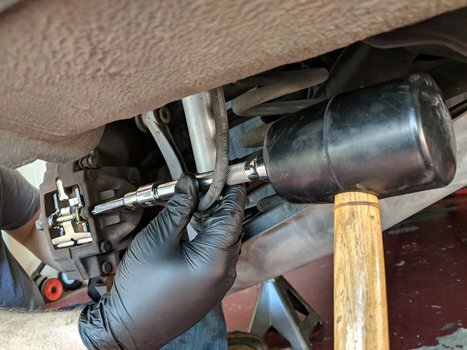 We found that we could daisy chain a pair of socket extensions together, which gave us the length needed to clear the brake hose and use the mallet, but you can come up with any sort of cylindrical extension to do the same thing. Once the pin is securely fit in the caliper, you're good to go! Repeat the same process on the other caliper. Reattach the first wheel and ensure it's properly seated on the hub, with the holes for the lug bolts aligned with the holes on the rotor. Screw in the lug bolts but don't tighten them fully. Make sure you tighten the bolts evenly. Once hand-tightened, use the torque wrench with a 17mm socket to tighten each bolt to 81 lb-ft, working in a star pattern. Reattach the hub cap. Repeat this process for the other wheel. Gently lower the car. 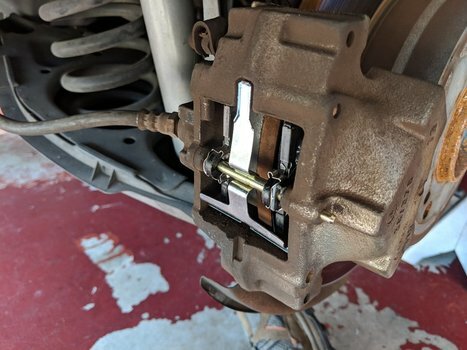 If you lifted the car from the front jack points in order to position the jack stands, you'll have to raise the car from the front jack point again, remove the jack stand, and then gently lower the tire back to the ground. If you popped the cap off the brake reservoir and removed some brake fluid, check the fluid level and replace some if needed. Screw the cap back on once finished. Hop in the car and pump the brake pedal a few times to restore brake pressure. Remember that new pads will have to "bed" before becoming 100% effective, so drive carefully for the first day or two.